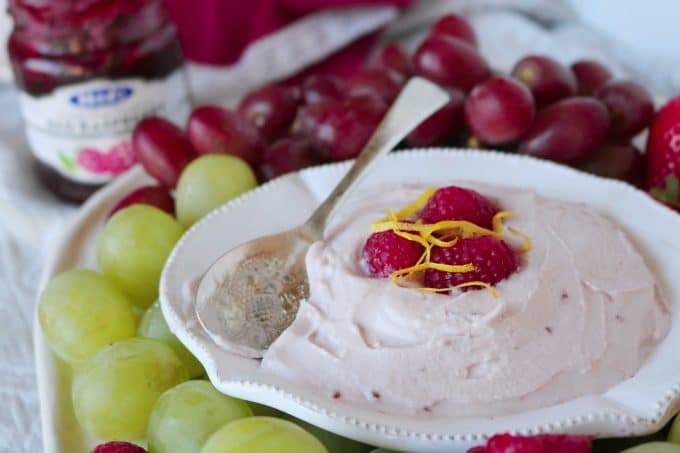 An easy recipe for a light cream cheese fruit dip featuring raspberry preserves, greek yogurt, and lemon. Sweet, just a little tangy, and absolutely perfect for dipping! If I have learned anything from years of entertaining, it is this: Us women? We love our fruit. So these days, if I’m hosting a gathering geared toward my lady friends, a fruit platter will most certainly be making an appearance. 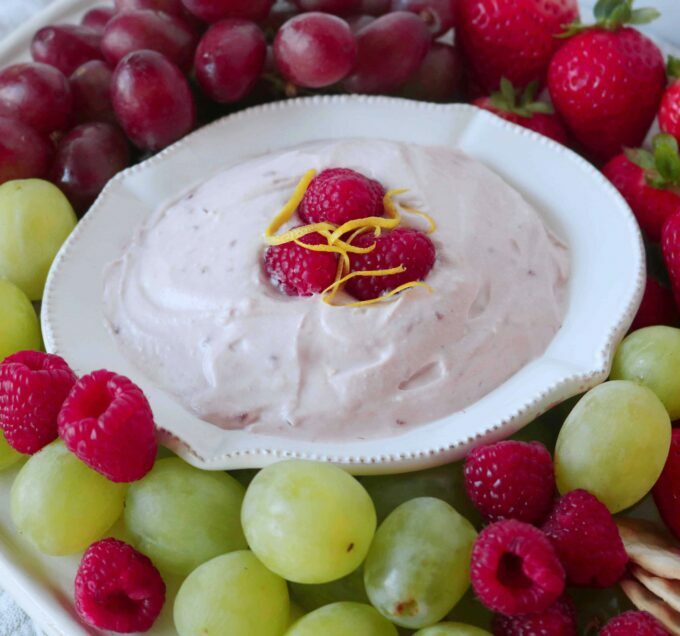 For an extra special touch, I serve this raspberry yogurt fruit dip alongside it. It’s sweet, slightly tart, and absolutely perfect for dipping. This fruit dip features creamy Mascarpone cheese, sort of like a mild, toned-down version of American cream cheese. The combination of both the Mascarpone and the American cream cheese allows for other flavors like raspberry and lemon to shine through. 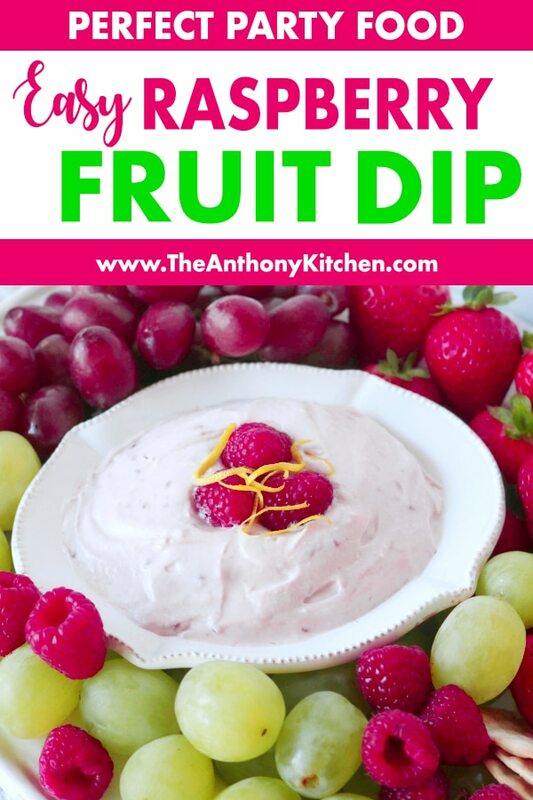 Fruit dip is easy to make and comes together in less than five minutes. 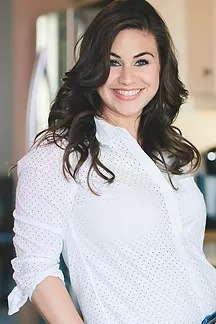 but what makes it even better is the fact that it can be made days advance, making this little number total perfection when it comes to entertaining. Fruit dips can be made using any number of ingredients, but most stealing the show these days are those made with a cream cheese base. Some are sweetened via the addition of powdered sugar, others even call for marshmallow cream, but for this recipe, the only sweetener we need comes in the form of raspberry jam. Yogurt adds a luxurious, creamy texture to the fruit dip, and for an added touch of tartness, the juice and zest of a lemon. The first thing to keep in mind when making a cream cheese fruit dip is that the cream cheese should be at room temperature before blending. This will ensure that the cream cheese blends in beautifully with the other ingredients and that the dip is smooth and creamy. If the cheese is not at room temperature before mixing, you will likely end up with little curd-like pieces all throughout your dip. Definitely not the end of the world, but if you have an eye for food aesthetics, this is something you’ll want to keep in mind in regards to prep time. 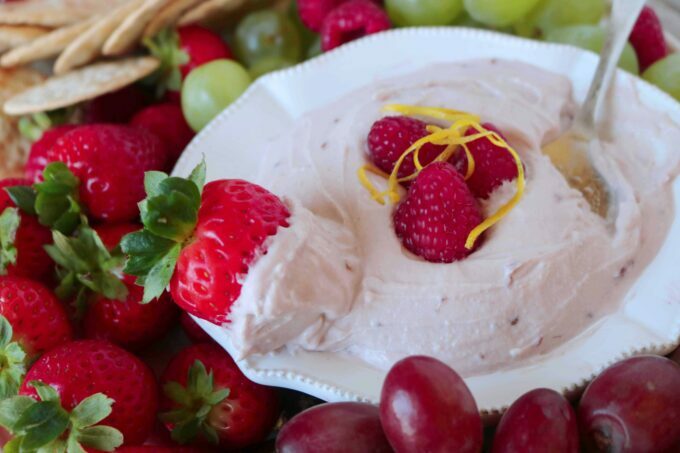 A light fruit dip, that doesn’t mask the flavor of the fruit, but rather, enhances it. Serve this dip alongside melon, strawberries, grapes, and pineapples, and enjoy! 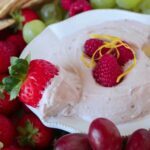 Marshmallow Fruit Dip is creamy, light and fluffy, but best of all, consists of only 3 ingredients and comes together in about 3 minutes flat. Cherry Cheesecake Dip is an easy, no-bake cheesecake dessert is made simple with a cream cheese base and a canned cherry pie filling. Creamy Lemon Cheesecake Fruit Dip is a quick and easy lemon fruit dip made with cream cheese and lemon curd. 10-Minute Caramel Apple Dip with cream cheese, salted caramel, and chocolate toffee is incredibly easy, perfect for dipping apples, and a must-have for your recipe arsenal! In the bowl of a stand mixer fitted with a paddle attachment, mix together both the Mascarpone and cream cheese until smooth. If you don't have a stand mixer, use a mixing bowl and a handheld mixer. Add the remaining ingredients and mix until smooth once more.Cover with plastic wrap and refrigerate until chilled through, one to two hours.